Bad Diaries Salon was established mid-2017 with a call out from Jenny Ackland on Twitter – were there any writers who still had their old, bad teenage diaries, and would they be prepared to read them live? The response was overwhelming. Result: four salons were held in 2017, and Bad Diaries Salon is back with a Winter 2018 series this July. There are more salons in the works, too, co-curated by Jenny Ackland and me. Follow Bad Diaries Salon on Twitter (@BadDiariesSalon) or Facebook, or check my Bad Diaries Salon posts. For this Bad Diaries Salon, the theme is #FIRST, and six published authors will read for ten minutes each from their early, unedited works. 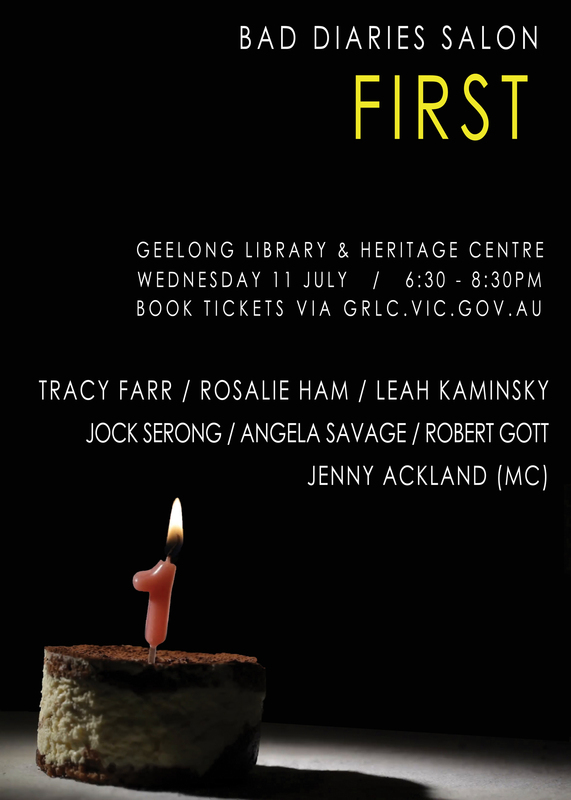 Featuring Robert Gott (The Port Fairy Murders), Rosalie Ham (The Dressmaker), Tracy Farr (The Hope Fault), Jock Serong (The Rules of Backyard Cricket), Angela Savage (The Dying Beach) and Leah Kaminsky (The Waiting Room) and moderated by Jenny Ackland (Little Gods).